Described as a “Kearney woman who can sing, paint, take photographs, ride horses, climb mountains and is an expert at baking bread,” (Denney) Miriam Worlock successfully pursued her talent for landscape and still life painting as well as ink drawing. She “was the first Kearney artist to have her work included in the Nebraska Art Collection (now Museum of Nebraska Art), the official state art collection….” (Kearney Hub) Also, she was a musician, teacher of Latin, community leader, and dedicated daughter, sister, wife, and mother. Miriam had two sisters and, like herself, they were noted for special achievements, but she was the only one who stayed in Nebraska. Her oldest sister, Ruth Matilda Anderson, became Curator of Costumes at The Hispanic Society of America in New York City and, as a photographer in the 1920s and ‘30s, completed a landmark documentary project in Spain on its contemporary culture. The younger sister, Elizabeth Anderson Udall, graduated from Barnard College in New York City, and became senior lecturer in phonetics in the Linguistics Department of the University of Edinburgh in Scotland. Miriam said that she was originally a photographer, and that “’father had me washing prints in his photo studio.’ As a sophomore in high school, Miriam was taking portraits for her father.” (Denney) In the 1930s, when his eyesight failed, she operated his studio, but closed it during World War II and never reopened it. “I was always interested in pictures, but when my third child went off to college I started painting.” (Horsford) As a young woman, she had begun “studying art with her father at his studio during her childhood….” However, knowing she needed to make money, she earned a two-year teaching degree in 1914 from Nebraska State Normal School, now University of Nebraska at Kearney (UNK). She applied her degree to teaching Latin and music. With her paintings, Mim “had a modest exhibition record showing only twice at Kearney State College…in 1969 and 1984, and once at the Kearney Public Library in 1977. The 1969 college exhibition featured a series of travel sketches done during a 1967 car trip to Scotland, England, France, and Spain with her sisters. 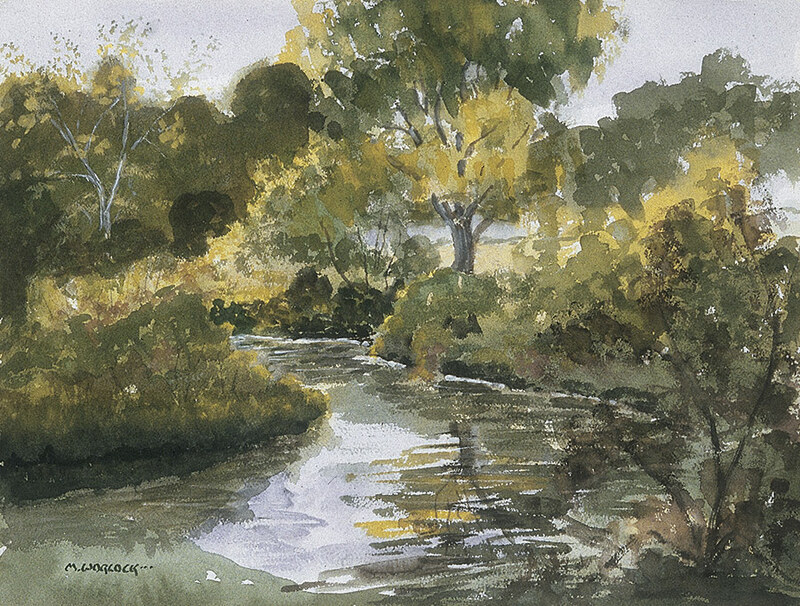 Included were images of castles, churches, gardens, medieval ruins, and rivers….The 1984 College exhibition featured mostly landscapes and floral still lifes in oil and watercolor done between 1952 and 1982.” (Martins 19) In 1987, work by Mim Worlock was included in the Museum of Nebraska Art’s exhibition, Selected Works of Nebraska’s Women Artists that was also seen in Red Cloud, Nebraska. The MONA collection has a portrait of Worlock by Nebraska artist Alton Larsen. Miriam Worlock died in October of 1985 at age 90 in Kearney, and is buried in the Kearney Cemetery. The Museum of Nebraska Art has 13 works by Mim Worlock. Museum of Nebraska Art Files: Denney, James, “Mother of the Year ‒ Hers Was a Most Important Job,” Sunday World-Herald Magazine of the Midlands, newspaper: 5/9/1965. Shawn Horsford, “A Conversation with Miriam Worlock,” Interview, conducted July 25, 1983 as an art class assignment for instructor Gary Zaruba at Kearney State College, Carol Lomicky, “Sisters Spend Summer in Their Home Town,” Kearney Hub, newspaper, undated. Miriam A. Worlock, Program of Worlock’s exhibition, January 6-24, 1969 at Kearney State College Student Union.